Quilts can be used to liven up a room, to keep someone warm, or to commemorate a special occasion in someone’s life. If you want to narrow your selection for quilting fabric, you have to figure out what kind of quilt you want to make. Textiles can be used for decorative quilts while blends are the perfect option for quilts that you plan to use on a regular basis. Find your purpose so you can choose the right fabric for your needs. Patterns are popular decorative elements for quilts. Once you know the kind of fabric that you want to use for your project, you can narrow your selection even more by deciding on one or more patterns that you want to incorporate into the piece. If you are still having trouble sorting through the impressive selection at the fabric store, feel free to ask for help. 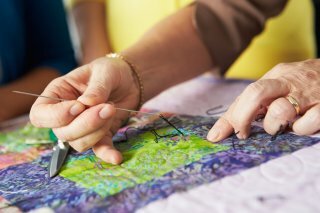 Talk to the staff about what you want to do with your quilt, and they can direct you toward a fabric that will meet all of your needs. If you want to create a softer, more comfortable quilt, for example, they will recommend a cotton or linen fabric. Spend some time in the fabric store in San Francisco to decide what kind of material will work the best for your quilting needs. This also gives you a chance to get new upholstery fabric that can complement the quilt that you plan to create. You might be surprised how much new fabric can change the look and feel of your décor.